Welcome to this beautiful twin in the heart of Conshohocken. The current owners have managed to update this property to accentuate the charm of the original bones, while seamlessly bringing in the modern touches sought after in today’s modern homes. You will notice from the moment you step onto the relaxing, covered front porch that this home has been well cared for. Enter into the inviting vestibule to appreciate the wide-open first floor, which offers a large sitting and living area that leads to an oversized dining room, and into the tastefully updated kitchen. The high 9+’ ceilings, updated lighting, and abundance of large windows combine to give the entire space the feel of a stately home. Off of the kitchen there is a 12-light door that leads to a newer half bath and convenient laundry area. Through a patio door you will find a new composite deck and private back yard perfect for entertaining. The second floor of this home has band new wall to wall carpet, a large master bedroom that offers tons of natural light, and a second bedroom with ample size and storage. A large and airy hall bathroom rounds out this floor. This home continues upstairs to the full, third level with two additional sizable and bright bedrooms. There is ample storage throughout ***OPEN SATURDAY September 15th, 2018 1-3pm*** Welcome to this beautiful twin in the heart of Conshohocken. The current owners have managed to update this property to accentuate the charm of the original bones, while seamlessly bringing in the modern touches sought after in today’s modern homes. You will notice from the moment you step onto the relaxing, covered front porch that this home has been well cared for. Enter into the inviting vestibule to appreciate the wide-open first floor, which offers a large sitting and living area that leads to an oversized dining room, and into the tastefully updated kitchen. The high 9+’ ceilings, updated lighting, and abundance of large windows combine to give the entire space the feel of a stately home. Off of the kitchen there is a 12-light door that leads to a newer half bath and convenient laundry area. Through a patio door you will find a new composite deck and private back yard perfect for entertaining. The second floor of this home has band new wall to wall carpet, a large master bedroom that offers tons of natural light, and a second bedroom with ample size and storage. A large and airy hall bathroom rounds out this floor. This home continues upstairs to the full, third level with two additional sizable and bright bedrooms. There is ample storage throughout the home, with the basement providing an additional storage space. 225 Spring Mill has had improvements around every turn; new lighting throughout, new hardwood floors, custom crown molding, new wall to wall carpet, updated windows, NEWER CENTRAL AIR AND HVAC SYSTEM, neutral d~cor, and excellent craftsmanship. The features of this stylish home, combined with an ideal location just a block and a half off Fayette Street, make this property a must see in a picture-perfect neighborhood. The listing price is $364,900. 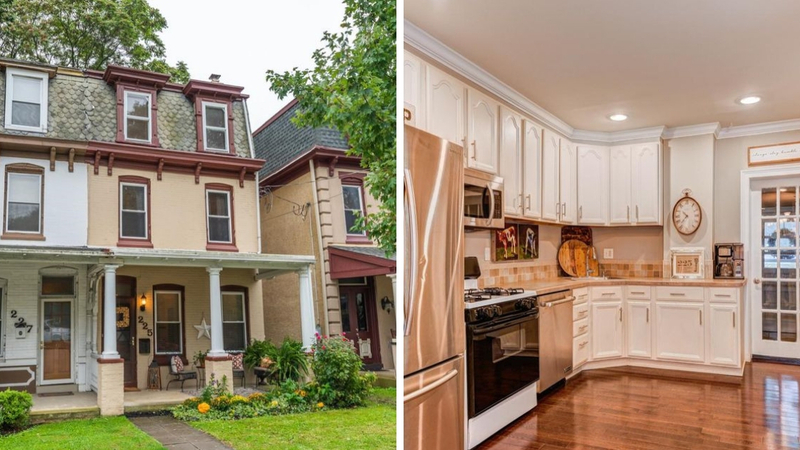 For more information or to schedule a viewing contact Borstein at (215) 631-3050 or drew@asoldhome.com.